Hello. It's me. . . I've got Adele songs in my head and I can't stop. Oh dear. 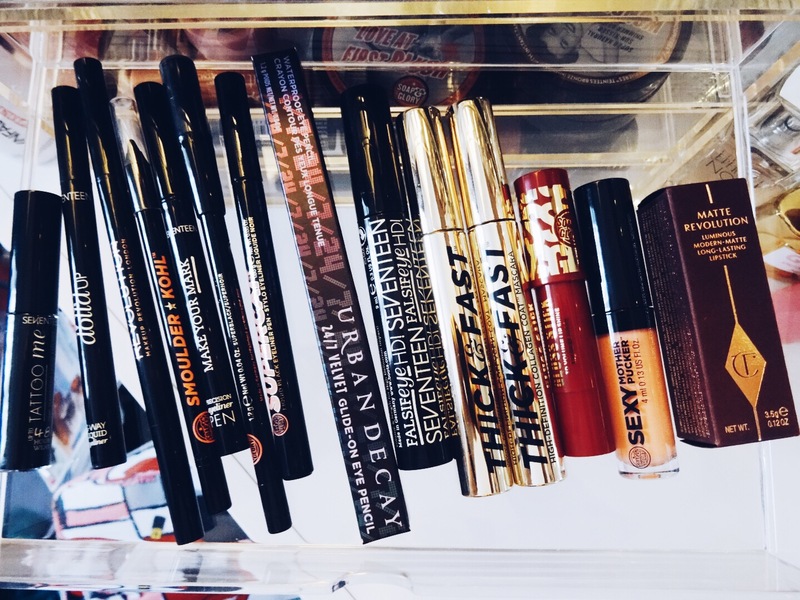 Anyway, today I wanted to show you some of my makeup storage. It's not all of it, but it's my day-to-day essentials and favourites in a neat and somewhat organized way. If I showed you everything it would just look a mess. I bought this acrylic storage from Muji. I started off with just two drawers but then it got too crammed in and it turned into me just stuffing things all the time. Not good. So then I bought another two and boom, I have a nice little system in place. I'm going to tell you about each drawer in the order that I use them, so starting from the bottom. In this drawer, I like to keep things for the base. 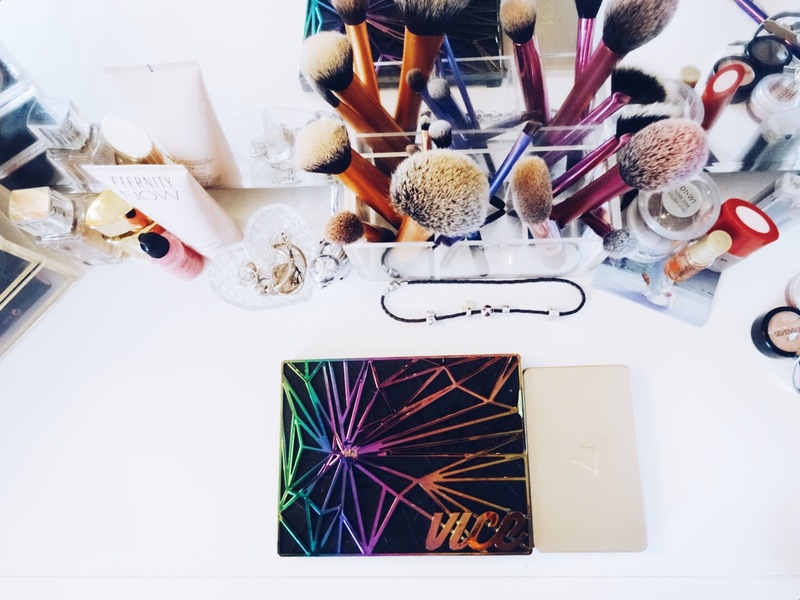 This includes primers, moisturizers and concealers, as well as those trusty contour palettes. If I'm feeling lazy with my makeup I try to make sure I always do my base properly, because it just helps me look a bit more awake, and with it. Ready to face the day! Next is a mixture of lip products and my Soap & Glory powders. They don't fit in the bottom drawer! 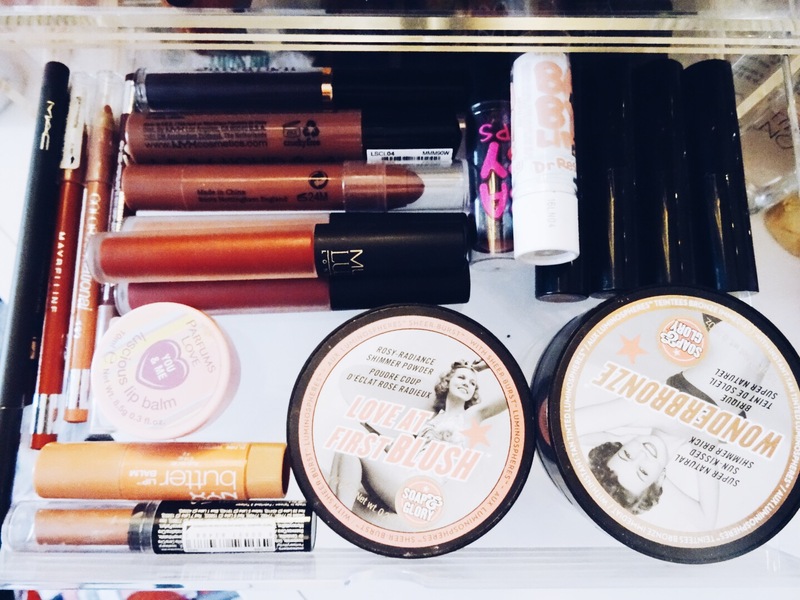 In this drawer, I like to keep all my liquid lipsticks that I'm loving, as well as the occasional lip balm or lippy. Whatever floats my boat. 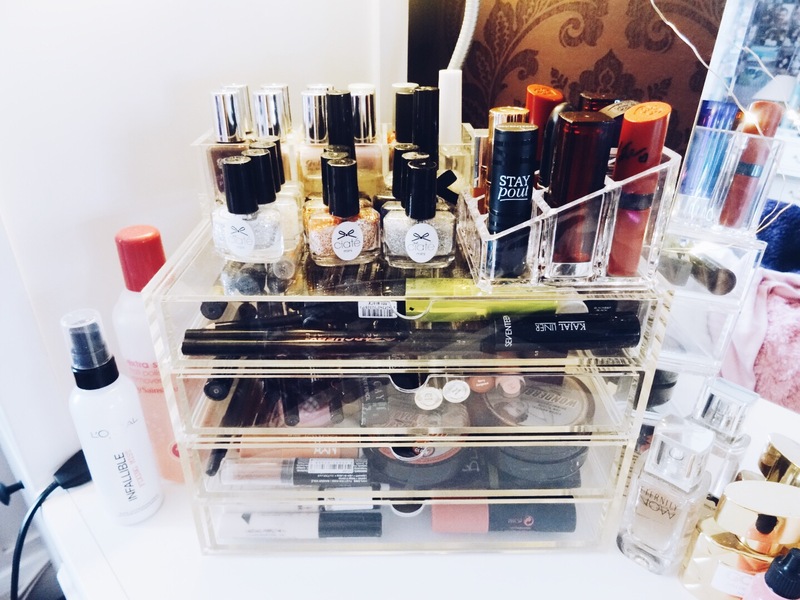 I keep all my favourite lipsticks on the top of this unit in a cute little acrylic display. Next drawer up, I guess this is a 'to-blog' drawer/new products drawer. 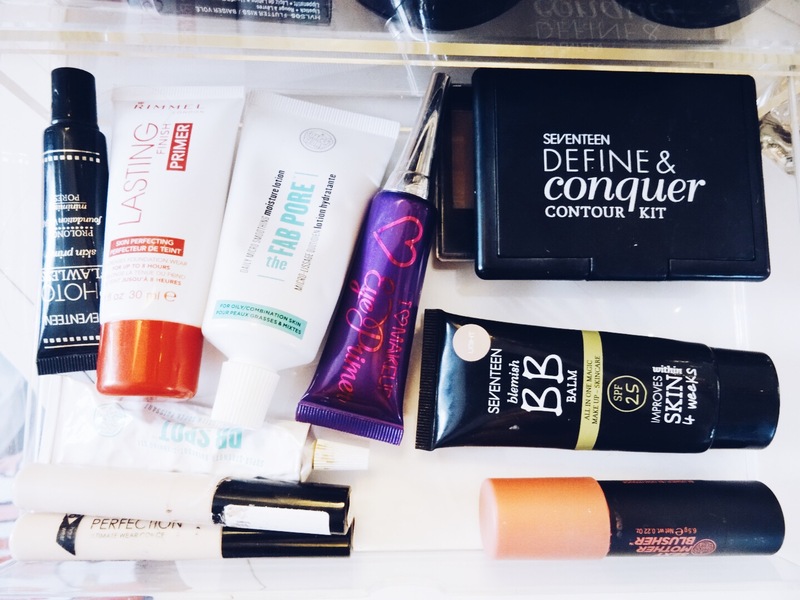 Do you ever have new products that are just so perfect you can't bare to use them yet? Hopefully, it's not just me! Anyway, I like to keep new products I haven't used yet in here for a number of reasons. Firstly, I want to remember that they're new and I haven't used them yet! There's always the chance that if I put them straight in the appropriate drawer I'd just reach for my usual fave and forget all about them! I also like to keep new products in here so that if I have any duplicates (looking at you Thick & Fast Mascara!) I know what to use up first before I open the newer product. I also like to keep products in here that I want to blog about in the near future. So you might just be seeing some of these in closer detail sometime soon! 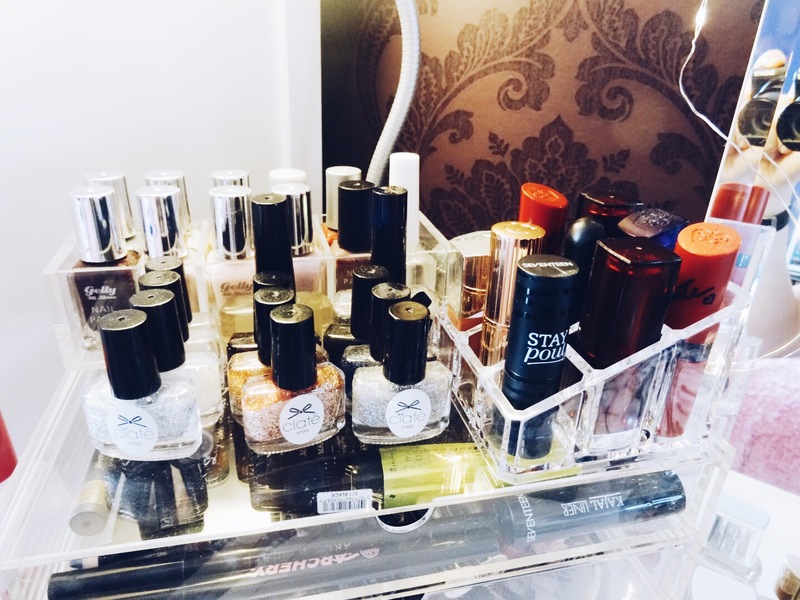 So, on top of the drawer unit, I like to keep my go-to nail varnishes, which are all either Ciate or Barry M. I'm going through a bit of a neutral or black phase with my nails at the moment, and let's not forget a good splash of glitter too. I also have my lipsticks! I'm making a real effort lately to try and use lipstick more. I think in the past I've been a bit scared, as it can make such a statement. I'm also just worried I'll forget I have it on and accidently smear it across my face without realising. My favourite at the moment has to be Rimmel 207. I hadn't used it for absolutely ages but I've rediscovered it and want to wear it all the time. All the time. I really want some more Nyx suede lipsticks, though, I mean aren't they just to die for! 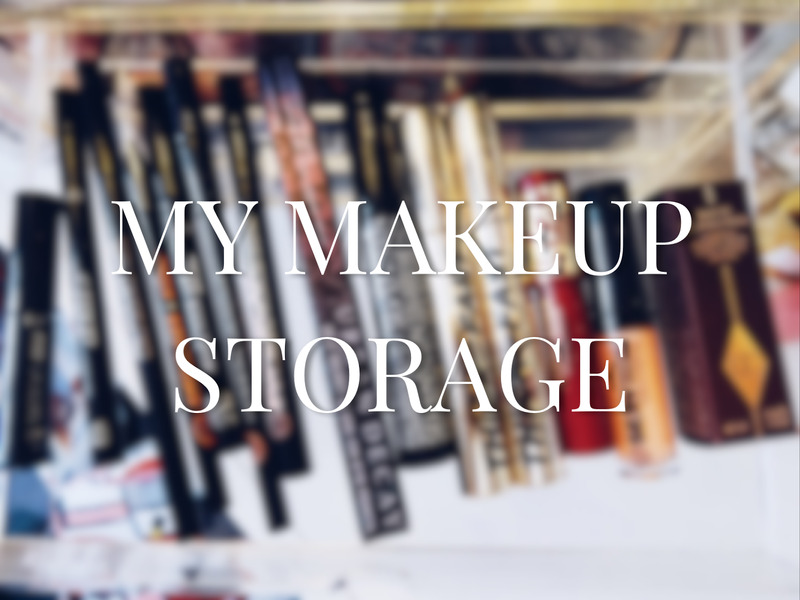 Now you've seen where I keep the bulk of my makeup, I keep palettes and extra stuff, or things I rarely use in the drawers of my dressing table. I think in the near future I'll have to have a sort out so that I can make room for even more lovely makeup! I love it at the moment, I feel like my friends and I are all really getting into and can share what our favourite products are at the moment. I love it! 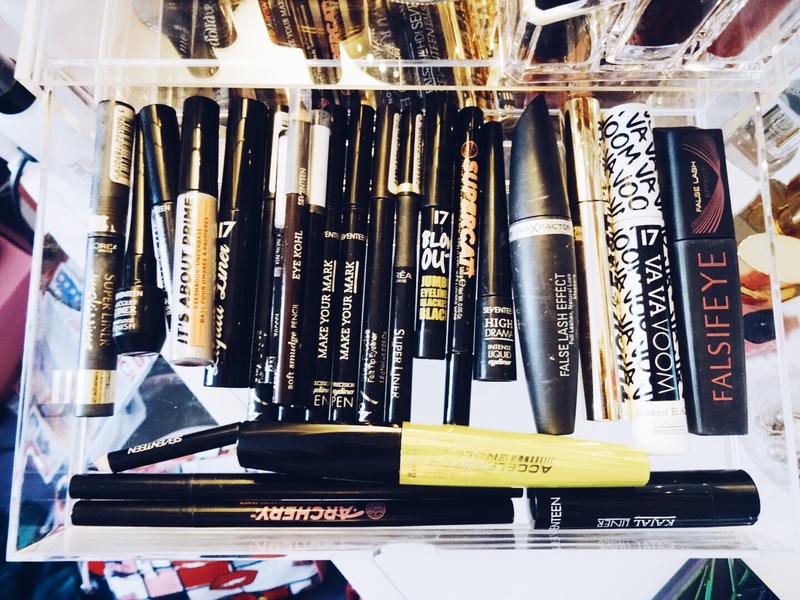 Anyway, I hope you enjoyed seeing how I organise my favourite makeup. It's slightly organised chaos, but it keeps all my day-to-day bits and bobs in one place.